The industry just makes sense. 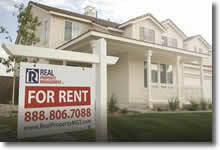 Residential property management has become one of the fastest growing industries in the country. More than one third of all residential households in the U.S. are rentals. The average revenue per property is $2,200 annually. In any economy, people need housing. The industry is stable and generates consistent monthly revenue. In other words, the demand for quality property management companies is substantial and increasing. Why? With higher credit lending standards, fewer Americans can afford to buy. Millenials are burdened with high college loans and prefer the flexibility of renting over buying. Prices for properties have rebounded, making them less affordable. Advances in technology have made it possible for investors to acquire real estate outside of their local markets. All this has resulted in significant growth and profitability potential for property management companies. Your role as a property manager would be to find and screen tenants, process rent payments, provide property inspections, maintenance & repairs, and process evictions when necessary. As the owner of your own business, you would be selling your services to property owners and investors, working with real estate agents and others to gain business referrals, and managing your business and staff. Our well established, proven operating systems and technology will streamline your operation and make you more efficient than your competitors. JOIN AN AWARD WINNING FRANCHISE. Real Property Management was recently named the 10th best franchise in the United States by Forbes magazine. We are also proud to be ranked on Entrepreneur magazine's list of top 500 franchise companies for the last six years; Inc. 500 recognized us as being one of the fastest growing privately held companies in 2010 through 2013. 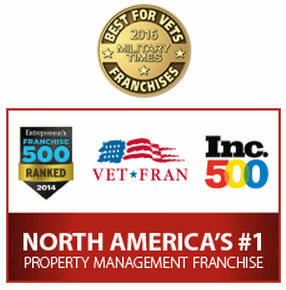 And, in 2013 franchise business review named us a top 100 franchise for veterans based on satisfaction surveys from our veteran owners compared to other franchises. WE TEACH YOU WHAT YOU NEED TO KNOW. Property management itself is a simple concept, yet the systems required to make it a smooth and efficient process require education and training. Our in-depth, comprehensive education programs are designed to give you a competitive edge from the beginning. In fact, most of our franchisees had no prior experience with real estate or property management. You will have 24/7 access to operating best practices, template agreements, documents and on-going support from industry experts. When attempting to grow or expand a business, having the right marketing tools that are professionally prepared is essential. Our huge selection of traditional advertising and online marketing tools, customized web sites, social media support, videos, scripts, emails and presentations will help you generate business. We're looking for franchise owners who want to build an ever-growing business. Our best franchisees enjoy networking and know how to sell, or they hire someone who does. Our franchisees come from all walks of life, and do not need previous real estate or property management experience. Our best franchisees were committed to working hard for the first few years before reaping the rewards of their efforts. You must have a minimum of $75,000 in liquid capital. Real Property Management is currently accepting inquiries from the following states: Wyoming, West Virginia, Wisconsin, Washington, Vermont, Virginia, Texas, Tennessee, South Dakota, South Carolina, Rhode Island, Pennsylvania, Oregon, Oklahoma, Ohio, New York, Nevada, New Mexico, New Jersey, New Hampshire, Nebraska, North Dakota, North Carolina, Montana, Mississippi, Missouri, Minnesota, Michigan, Maine, Maryland, Massachusetts, Louisiana, Kentucky, Kansas, Indiana, Idaho, Iowa, Hawaii, Georgia, Florida, Delaware, Washington, D.C., Connecticut, California, Arizona, Arkansas, Alabama, Alaska. Interested parties should have at least $70,000 in liquid capital to invest.